Another opportunity to enjoy Lake County history will be available to the public on Saturday, May 23, when the Ely Stage Stop & Country Museum presents the next in a series of Living History events from noon to 2 p.m. Local historian Ruby Glebe will return to the Ely Stage Stop & Country Museum on Saturday to share more stories from the past. Glebe is well known and respected for her work in preserving and promoting Lake County’s historical resources. Fifteen years ago the County Board of Supervisors appointed Glebe to the position of Lake County Historian. She is only the third person to hold this distinction, preceded by Henry Mauldin and Marion Goebel. Glebe will be available to the public in the Ely main house starting at noon to visit with guests and answer questions. At 1 p.m. she will present a program relating to Dr. Hugh J. Glenn for whom Glenn County, northeast of Lake County, was named. Dr. Glenn, a man of great prominence in political and commercial life, was considered to be the “wheat king” of the western world managing 45,000 acres of wheat. Learn how the agricultural opportunities of his day related to the success of the pioneers settling in Lake County. She will remain available until 2 p.m. for more questions and insights. Home to the Lake County Historical Society, the stage stop is located at 9921 State Hwy 281 (Soda Bay Road) in Kelseyville, near Clearlake Riviera, just north of Hwy 29-Kit’s Corner. Current hours of operation are 11:00 a.m. to 3:00 p.m. each Saturday and Sunday. Living history events are held on the fourth Saturday of each month. Visit www.elystagestop.org or www.lakecountyhistory.org, check out the stage stop on Facebook at www.facebook.com/elystagestop, or call the museum at 707-533-9990. The Ely Stage Stop & Country Museum historic building, considered to be one of the oldest “stick built” buildings in Lake County, was moved from its prior location on Highway 29 in 2007. After the move, Lake County’s Public Service Department took on the task of installing the building on the site, bringing in utilities, restoring the inside and constructing the entrance, driveway, and parking area. Since then much progress has been made in transforming the property into the vision under which the original project was conceived. It is time to recap the progress made and show special appreciation to those individuals or businesses whose contributions have helped us grow into one of the most important educational and historical centers in Lake County. Much research, creativity and effort was required to restore the main house into the showcase it has become today, from wallpaper selections to construction of the beautiful wrap-around porch. What resulted is a beautiful museum with ever-changing displays for the public to enjoy. The house has been used for a variety of fund-raising events such as a Farm-to-Table Dinner in 2012, the annual June Picnic on the Porch in 2013 and 2014 (with a repeat planned for this year) and a Whiskey In America tasting in 2014. The annual Art and Science Camp, sponsored by the Children’s Museum of Art and Science, has been co-hosted by the Stage Stop and the Taylor Observatory in Kelseyville for the last three years. 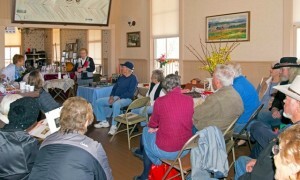 The living history presentations by Stage Stop docents are always a hit with the fourth through sixth grade students. The Camp returns for a fourth year in May. Excitement really grew as the first barn construction got under way. The completed structure affords a refuge for our stage coach, various wagons, and other equipment needing protection from the elements. Gracing the barn is our Carpenter’s Star quilt block, donated anonymously through the Lake County Quilt Trail Project. The block was temporarily mounted on the wrap-around-porch, but it now has a permanent home on the barn. The carpenter theme highlights the many hours of manual labor volunteers have donated to make this first barn possible. 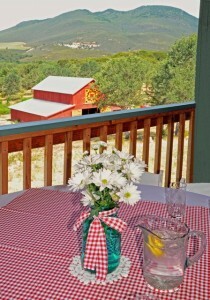 The barn has also become a popular event venue. 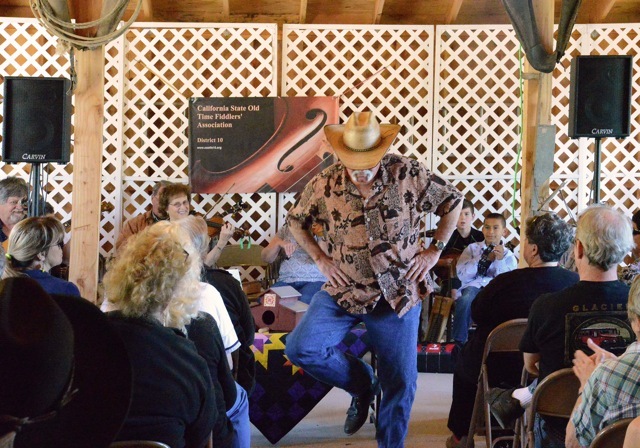 The Stage Stop partners with the Northern California Old Time Fiddlers Association on the first Sunday of each month for Fiddlers’ Jam Sessions. Lake County has a bounty of talented musicians and the barn has proven to be the perfect venue to celebrate these local musicians and the American music heritage from the Ely Stage Stop Victorian Era. Our community has passionately embraced this cultural opportunity. On the fourth Saturday of each month local historians come to the main house from noon to 2 p.m. to visit with guests and answer questions regarding different aspects of Lake County history. As these visits are recorded, the stories of Lake County’s history are being preserved. Sturdy picnic tables afford picnicking on the grounds in fair weather. An historic1890‘s cable car and “Wiley” signal light reside at the Ely Stage Stop & Country Museum for the public’s enjoyment. When you drive by 9921 State Hwy 281 (better known as Soda Bay Road) you will know exactly where to find the Ely Stage Stop & Country Museum. The long awaited signage was erected in May of 2014. Bearing the striking Ely logo, the sign greets visitors and lures passers-by regardless of which direction they are traveling. The current project being undertaken is the all-volunteer building of a working blacksmith shop which will serve as another interpretive and living history exhibit. Phase one of that complex is shaping up now next to the first barn. Thanks also to the many anonymous and other unnamed donors who have contributed to this ongoing project to preserve Lake County history. We could not have accomplished so much without all of you. On June 13 the Ely Stage Stop & Country Museum will celebrate the arrival of summer with their annual Picnic on the Porch. 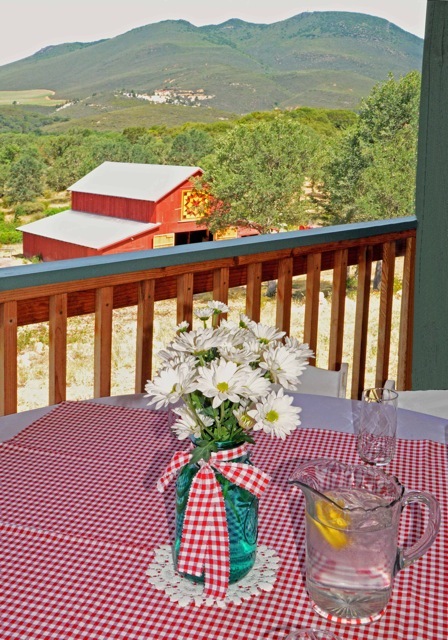 It promises to be a food and fun-filled day on the wrap-around porch looking out on Mt. Konocti. Seating is limited so get your tickets now! The return of this annual event is greatly anticipated by those who have attended in past years and those who may have missed out. The day will be filled with entertainment and living history. Professional Harpist Linda Brown will offer a range of Celtic, classical, and other melodies. A delicious seasonal box lunch from Rosey Cooks, local gourmet catering owned by Rosemary Martin, will be provided at noon. Rosey’s lunch is always a big hit. Bring your own wine to sip in beautiful Ely Stage Stop wine glasses that are always available for purchase. Fashions “Then and Now” will be featured during the event. Barbara White, local specialist in period clothing, will model fashions popular in the Stage Coach Era. Anna Jones, of Anna’s Boutique, will model local contemporary women’s fashions. Games, basket raffles and silent auction items will round out the afternoon. This year the main house will showcase the newest display on the history of the Dairy Industry in Lake County. In addition to the stage coach and retired San Francisco cable car, seldom seen pieces of historic farm equipment can be viewed in the barn and on the grounds. Come see the progress being made on our Blacksmith complex. Although lunch is typically served at noon, the fun will begin at 11 a.m. and continue until 3 p.m. Event cost is $30/per person. For tickets, call 707-533-9990 (Ely’s message line) or visit the museum and ask the docents for tickets during museum hours, Saturdays and Sundays, 11 a.m. to 3 p.m. Tickets must be purchased by June 8. The Ely Stage Stop & Country Museum, home to the Lake County Historical Society, is located at 9921 Hwy 281 (Soda Bay Road) in Kelseyville. Visit www.elystagestop.org or www.lakecountyhistory.org or check out the stage stop on Facebook at www.facebook.com/elystagestop. The Ely Stage Stop & Country Museum continues the celebration of the American music heritage from the Ely Stage Stop Victorian Era, welcoming back the Old Time Fiddlers Association for the monthly First Sunday Fiddlers’ Jam on Sunday, May 3rd. Local musicians of all ages will meet in the Ely barn from noon through 2 p.m. to perform in the round robin style jam session. The fun begins at the museum at 11 a.m. Come and enjoy the newest display in the main house celebrating the Lake County Dairy Industry. Collections of milk bottles and butter churns are featured with old photos from by-gone days at the dairies. There will be the regular monthly raffle near the end of the jam and more chances to purchase raffle tickets for the “Barns, Birds and Quilts” raffle that will celebrate a winner later in the year. Those items will be on display during the jam. This free, family-friendly, fun-packed day can be enjoyed by all, young and old alike. Make it a day. Beverages and tasty treats will be available from the docents. Or bring a lunch and maybe some wine and picnic in the Oak Grove. View the stagecoach, chuck wagon, buckboard and other large display items on the grounds around the barn. Check out the progress being made on the blacksmith complex and then take a ride up to the house on the hay wagon. Many surprises await. So see you there! Donations made during the jam benefit both the Ely Stage Stop, helping to fund the construction of the blacksmith complex, and the Old Time Fiddlers Association District 10, who uses it to partially fund their scholarship programs. Home to the Lake County Historical Society, the stage stop is located at 9921 State Hwy 281 (Soda Bay Road) in Kelseyville, near Clearlake Riviera, just north of Hwy 29-Kit’s Corner. Current hours of operation are 11 a.m. to 3 p.m. each Saturday and Sunday. 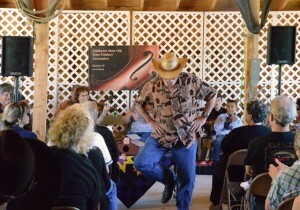 Fiddlers’ Jams occur the first Sunday of every month from noon until 2 p.m. Living History events featuring local historians are held on the fourth Saturday of every month, again, from noon to 2 p.m.
Visit www.elystagestop.org or www.lakecountyhistory.org, check out the stage stop on Facebook at www.facebook.com/elystagestop, or call the museum at 707-533-9990.